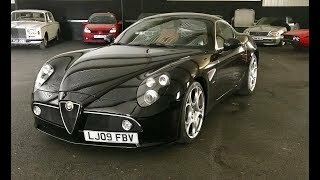 The Alfa 8C is one of the most desirable Alfas ever created. Powered by a 450bhp, 4.7litre V8 and with a curvaceous body created out of carbon-fibre but what's it like to drive? Find out here.. Many thanks to https://classicmotorhub.com for the loan of this car, where it is just gone up for sale.